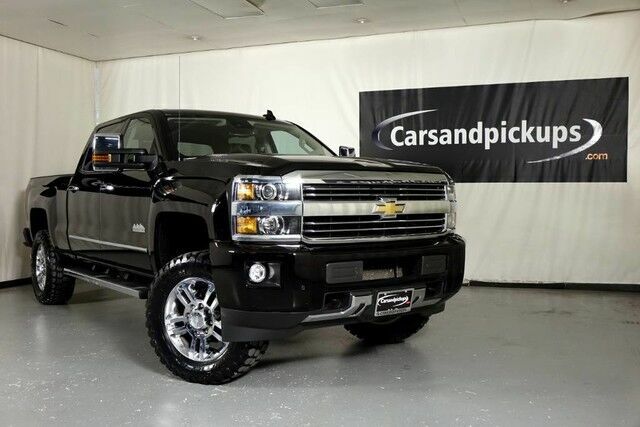 Stock # 231526, Duramax 6.6L Turbo Diesel V8 B20-Diesel Compatible Engine, Automatic, 71892 mi. **1 Owner**Clean Carfax**4x4**6.6L Duramax V8 Turbo Diesel Engine**Allison Automatic Transmission**Crew Cab High Country Edition**20" Factory Alloy Wheels**New 35" Mud Terrain Tires**Factory Fog Lights**Projection Headlights**Navigation**Dual Zone Automatic Climate Control**Bose Premium Audio**Driver Alert Package**Key Less Entry W/ Remote Start**Heated Steering Wheel**Leather Interior**Heated & Cooled Front Power Bucket Seats**Rear Folding Split Bench Seat**Power Sliding Rear Window**Spray In Bed Liner**Fixed Running Boards**Front & Rear Parking Sensors**Reverse Camera**Tow Package**For More Pictures and Inventory go to Carsandpickups.com Call us at 972-239-3688. Trade Ins Welcome! Shipping, Financing, and Warranties Available!!! Text 972-846-4164 for quick answers about this vehicle. Videos available upon request. Bed Liner Spray-on Pickup box bed liner with bowtie logo. Liner is permanently bonded to the truck bed providing a water tight seal. The textured non-skid surface is black in color and robotically applied. Spray-on liner covers entire bed interior surface below side rails including tailgate front box top rail gauge hole plugs and lower tie down loops. consisting of high pressure chemically bonded sprayed-on polyurea & polyurethane liner formulation. Liner is permanently bonded to the truck bed providing a water tight seal. The textured non-skid surface is black in color. Spray-on liner covers entire bed interior surface below side rails including tailgate front box top rail gauge hole plugs and lower tie down loops.